What do you want for Valentine's Day? May I suggest PHLUR. PHLUR is an online fragrance destination that has 6 fragrances in its house, that are all meant to be used on the skin, where fragrance should be scented. Their fragrances are extremely exotic. I have tried Olmsted & Vaux prior to this and now MOAB. Let me tell you, they are intoxicating and exquisite fragrances. I cannot wait to try more of them. You can sample them for $15.00 and they will send three 2ml of three scents for you to try. Or you can gift them to someone. Olmsted & Vaux is similar to the scent of a nature but you get a bit of cleanliness pulled in there so as not to make it too masculine. I just tried MOAB. Let me tell you, this is an amazing scent. It starts off full and rich, overwhelming the senses. You are reminded of lying in the desert in the hot sand. Then it calms down to just the tonka bean in it. When it starts off full and rich you are smelling the jasmine and the pepper. But it smells divine. Its arid spice is reminiscent of the vastness of the West, emanating an invigorating dry heat. MOAB is PHLUR's translation of the feelings inspired by the desert's sun, wind and openness. Next time you take a long drive out West, or wish you could, this is the scent that will bring back those memories further on up the road. It comes in Eau de Parfum. The perfumer is Ralf Schwieger. 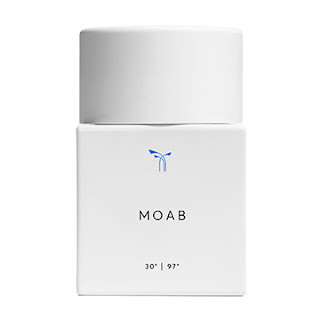 The notes for MOAB are long pepper, clove, vanilla, jasmine and tonka bean. I really like this scent. I have NEVER smelled something like this before. It is really unique. The clove and tonka bean come alive. But the jasmine is in there for good nature so as not to make this too masculine. I am looking forward to trying out the other fragrances in their collection. These are five others: Hanami, Olmsted & Vaux, Greylocke, Hepcat and Siano. Hanami is described as an aquatic floral tableau, with a reverent subtlety and a warm embrace. Olmsted & Vaux is bright, crisp and ultimately clean. Revitalizes with every wear. Greylocke is refreshing and restorative, and expression of nature and New England heritage. Hepcat is described as coarse and fearless meets smoky and raw. Siano is a pure expression of elation, as enchanting as it is powerful. Phlur products are cruelty-free and free of all allergens, parabens, phthalates, unnesecessary stabilizers and animal products. Made and sprayed in the USA. Any one of these would make a great gift for someone who loves fragrances. I know I love mine. If you know what someone likes you would be able to pick something out for someone easily. Or you could gift someone a PHLUR fragrance. For $95.00 the giftee receives a personalized card, gets to choose 2 sample bottles of fragrance and gets a full size bottle of fragrance. This is a great option to try if you are not sure what she wants www.phlur.com/shopping/gift_items/new.Try PHLUR for the Valentine's Day, you will not be disappointed! PHLUR can be found online at www.phlur.com. Like PHLUR on Facebook:https://www.facebook.com/Phlur/; Follow PHLUR on Twitter:@phlurfragrance;Follow PHLUR on Pinterest:https://www.pinterest.com/phlur/ and Follow PHLUR on Instagram :https://www.instagram.com/phlur/.